From the street and from inside, this house appears rather simple and unimposing, but in fact it is a very large house with an extremely complex program. Significant parts of the house are cut into the bluff and are not visible from the street and these buried spaces express themselves as irregular horizontal fissures in the hillside. 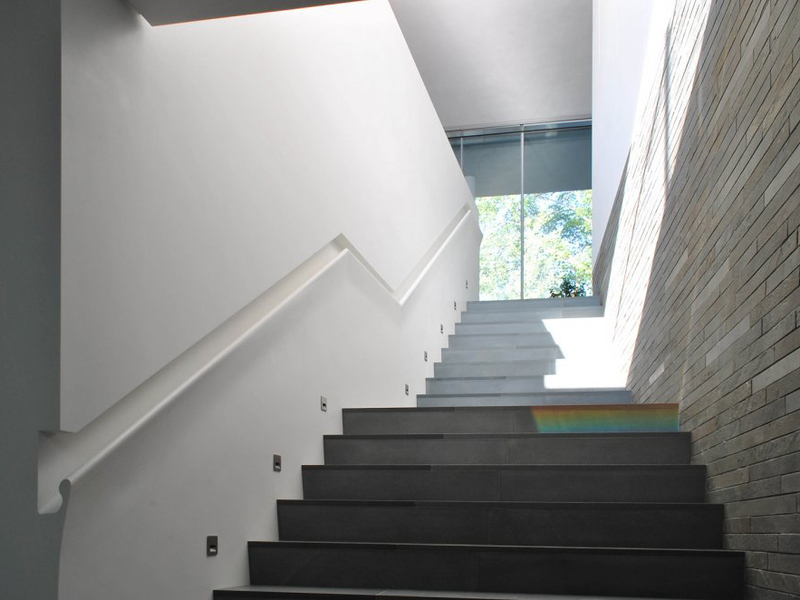 The experience of moving through the house from the bluff to the lake takes advantage of the steep slope by way of a series of descending spaces set off from one another in both plan and section which afford dramatic and ever-changing views of the water. 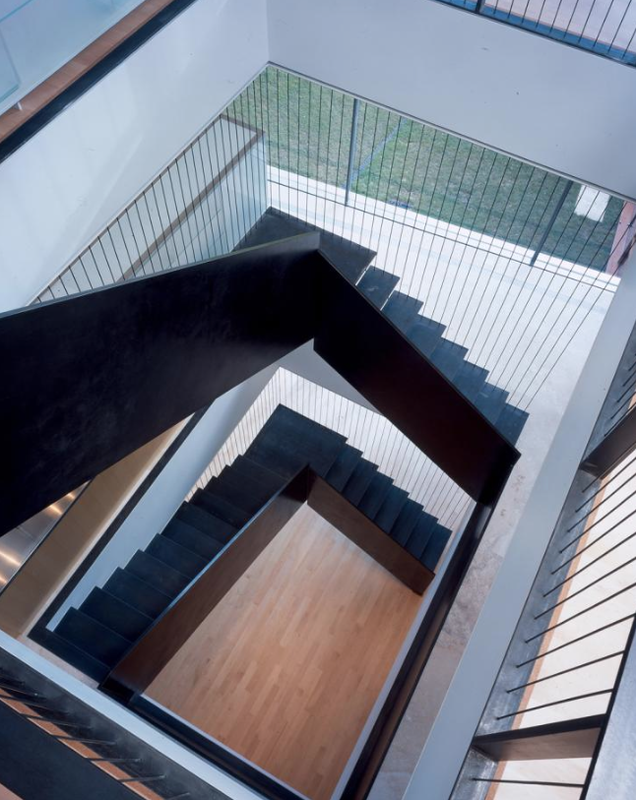 At grade, two “bars” containing the parents wing and garage/kitchen respectively carry a glass box containing the children’s bedrooms and playrooms. 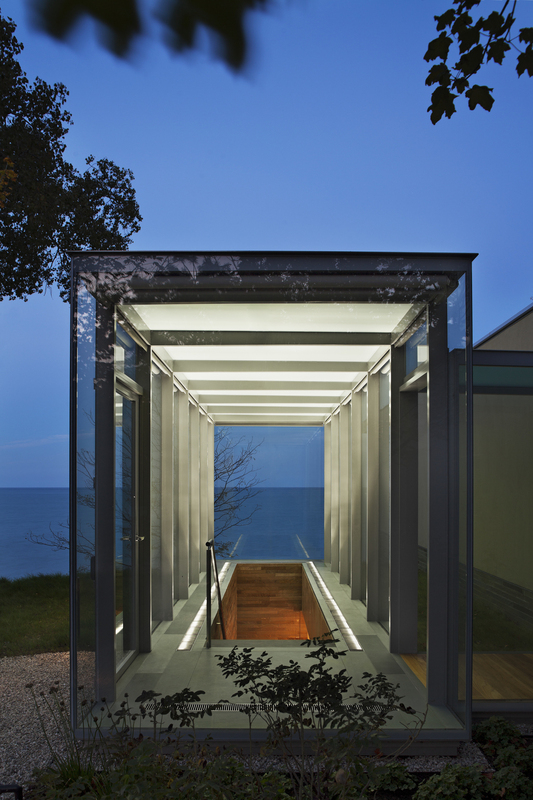 The box is constructed with massive steel trusses mounted on 4 steel columns which allow for unencumbered views to Lake Michigan and make the box seem to float above the living areas below. The subsurface areas which make up half of the area or the house contain guest and maid’s quarters, office space, a lap pool, gym and basketball court. A fresh-water pool and stone clad boat house complete the terraced landscape down to the water’s edge. 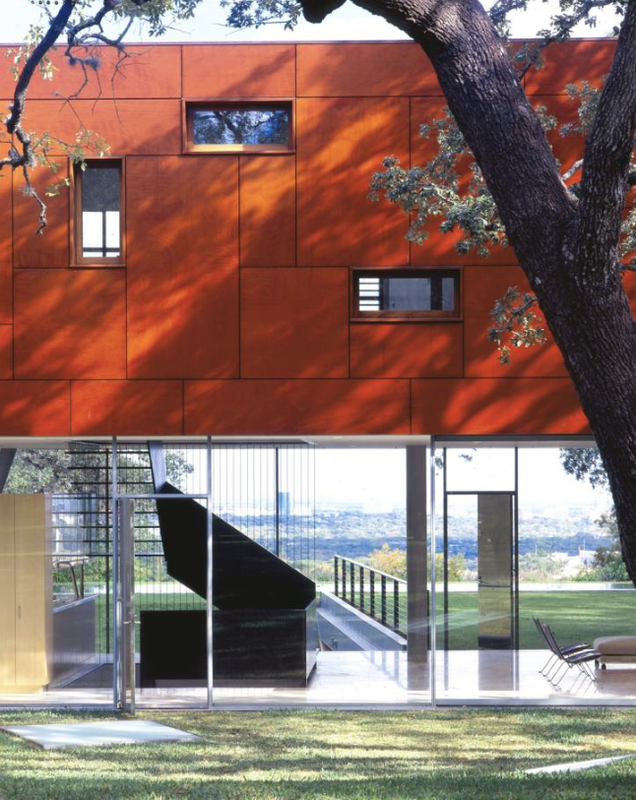 Although large with much glass, the house received LEED certification and incorporates green roofs, a geothermal heat pump system, a solar array and many other energy efficient systems. Standing amid a grove of two hundred landmarked live oaks, significant portions of this house were built below grade to maintain the rural landscape of the site. 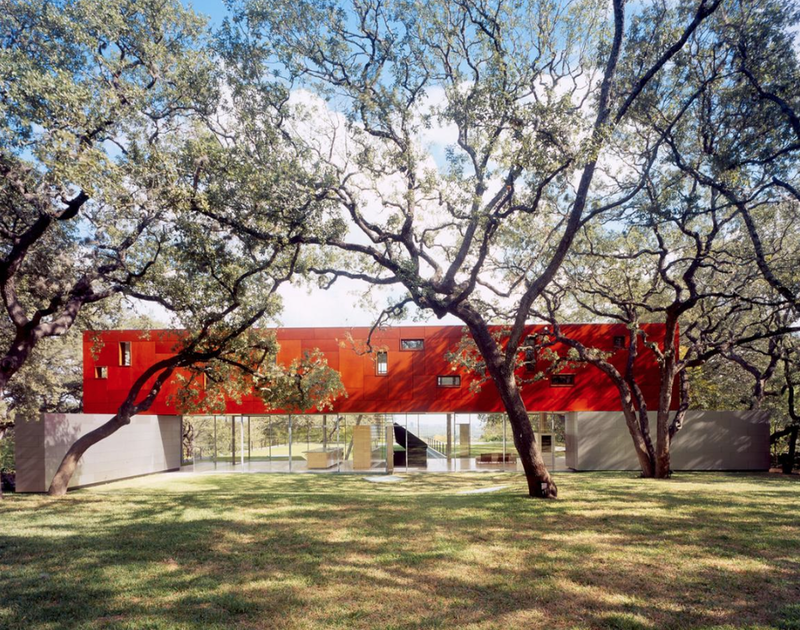 Between the ground plane and the floating box is an entirely transparent glassed enclosure that gives the living room, dining room, and kitchen unobstructed views of the natural surroundings on one side and the Austin skyline on the other. 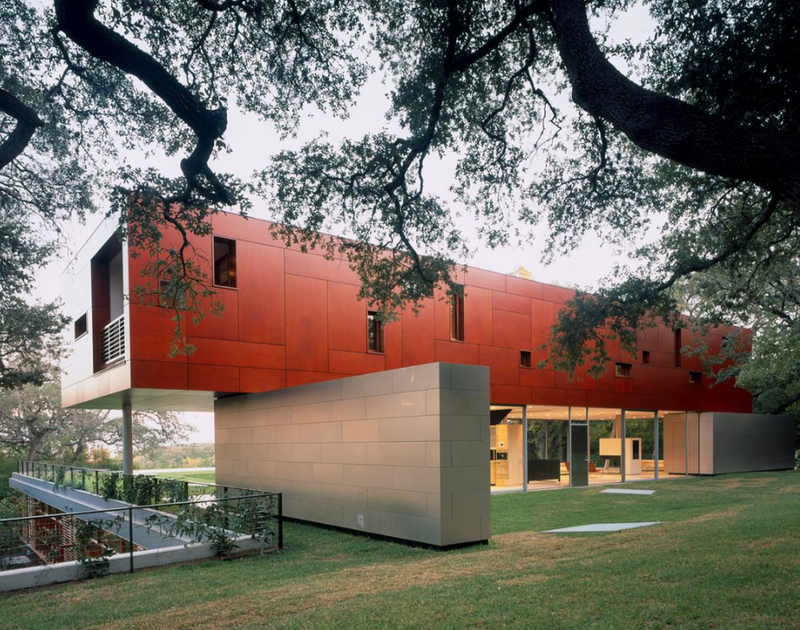 The stainless steel structure holds all the mechanicals for the house and produces the illusion of a wall-less space and a floating box above. Moving through the building, the sectional complexities add to the spatial experiences inside and outside the house. 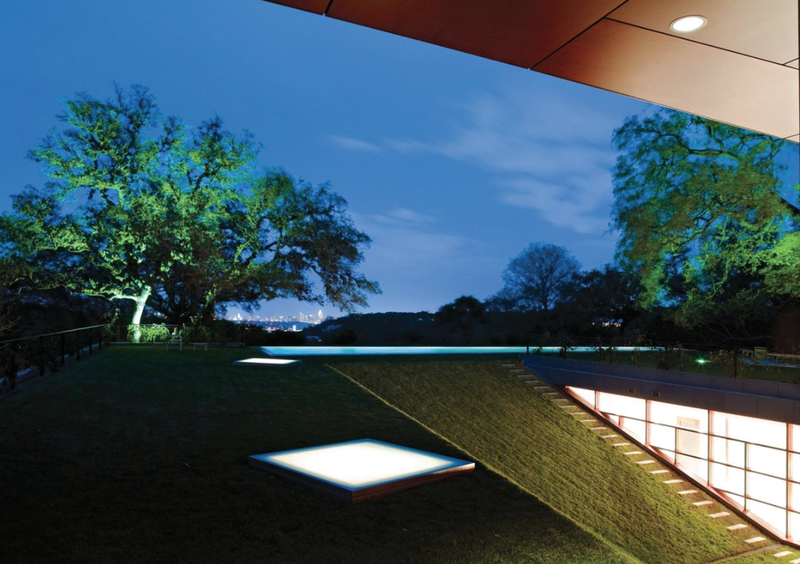 The sunken courtyard, formed by a sharp cut in the earth, connects the ground floor to the transparent living room by an upward-sloping grass ramp. This ramp becomes the roof of the buried sections, with skylights cutting through the grass to provide natural light for the spaces below.